Depth can expand to 8"
The OPPOSETHIS Invisible Carry-On comes to us from Lithuania, with the aim of “simplifying air travel.” This carry-on travel pack is the result of a collaborative design project with over 500 fellow travelers, and was successfully funded through Kickstarter in under a month. 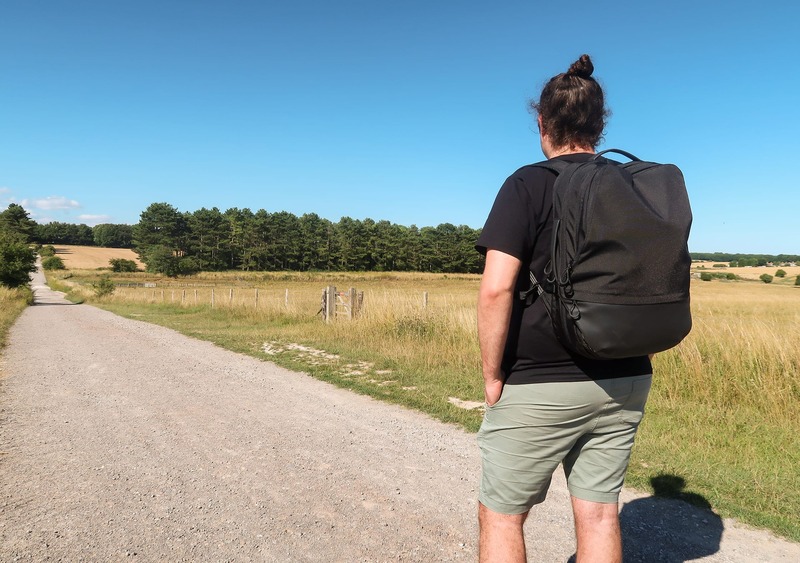 One of the many exciting things about this bag is that it eliminates the need to bring a daypack on your trips, as this thing compresses down from a 33L travel bag to a 24L daypack. We’ve seen designs like this before—such as the Tortuga Setout Divide—but we’re always excited to test how other companies handle this interesting, and tricky-to-nail concept. After a month of testing, this pack has seen use as a travel bag for a week long trip to the West Country of England, and plenty of daily trips to the coffee shop and gym. 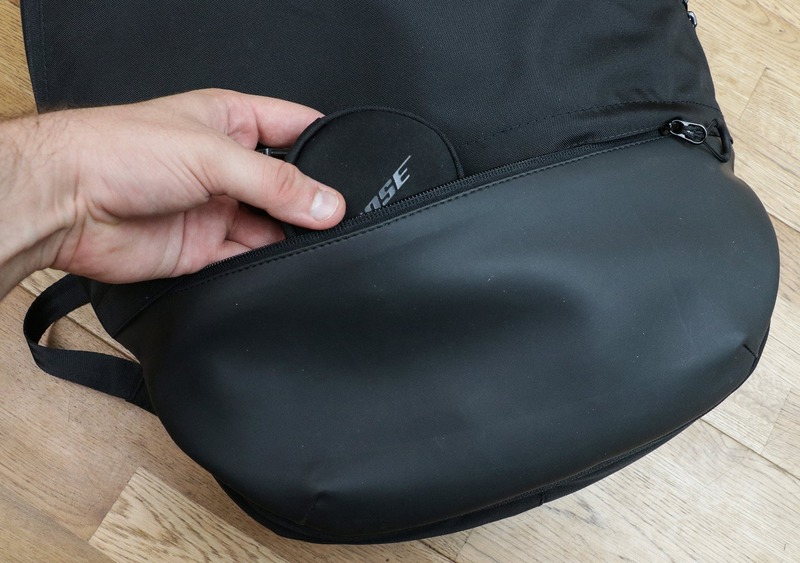 Has the OPPOSETHIS Invisible Carry-On succeeded in its task of simplifying the way you travel? Let’s get into this review and find out. The Invisible Carry-On is part of the OPPPOSETHIS Invisible Design concept. In their own words, it’s “heavily influenced by the industrial minimalism of Dieter Rams and the underground movement of urban techwear” and “the name Invisible was chosen to project the non-constricting nature of each bag we design – both in aesthetics and functionality.” To put it simply, they design bags that don’t stand out and work in a multitude of different environments—long gone are the days of wandering around a city in a bright orange hiking bag. True to it’s “Invisible” name, OPPOSETHIS hasn’t plastered its logo all over this pack. The branding on this bag is so minimal that it is, in fact, invisible when you’ve got the pack on. The only logo is on the back, between the top of the shoulder straps—which is pretty hard to see, even when you’re looking for it. 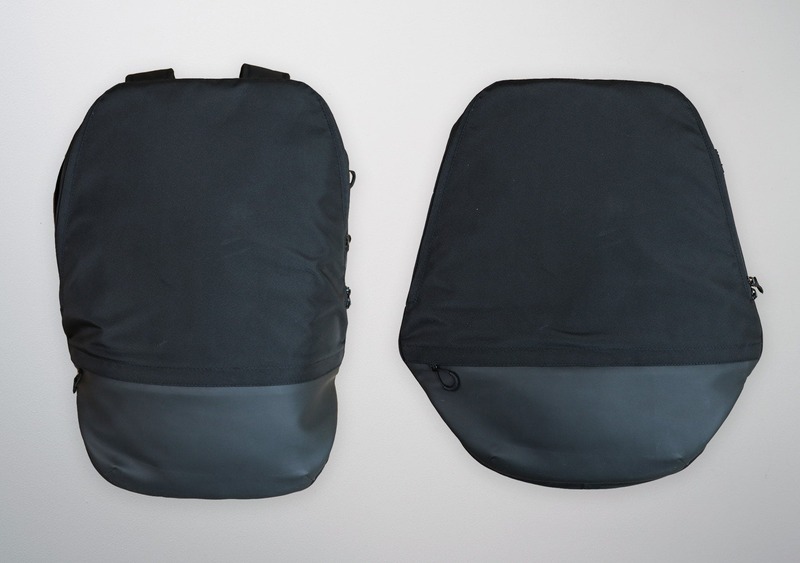 The Invisible Carry-On is available in two colors, black (unsurprisingly) and navy. We’re digging the all black look, and if you’re buying into the invisible design concept, then black is undoubtedly the way to go. To be brutally honest, we’re not huge fans of the overall look—we mainly dislike the overhanging material on each side at the front. 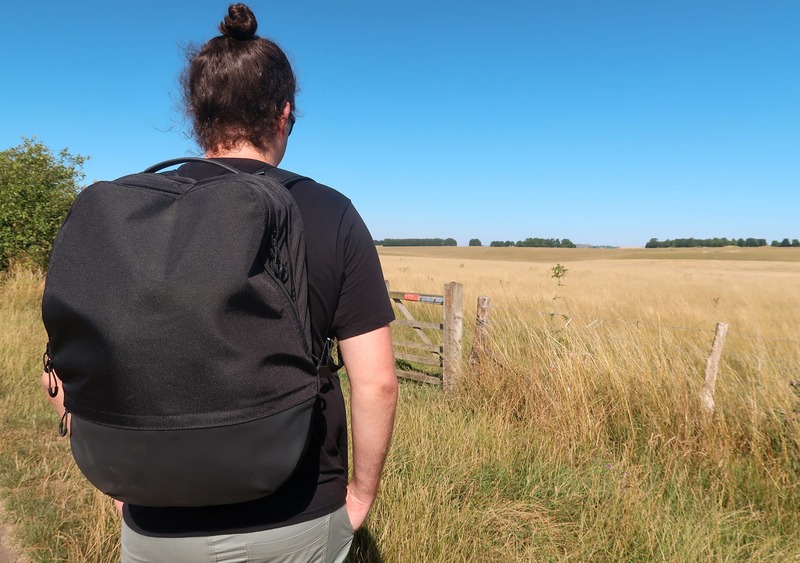 The pack looks good when it’s full to the brim and that overhanging material is pulled around, but in daypack mode it just looks a bit… odd. We decided to ask our Instagram audience. From 166 participants, only 55% of people said they liked the aesthetics, so pretty hit-and-miss. 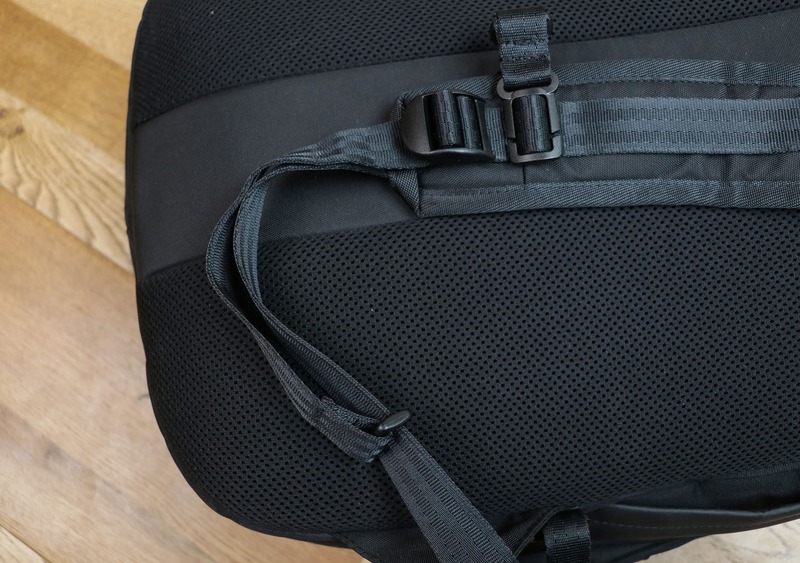 The outer shell of the Invisible Carry-On is primarily made from a blend of 600D nylon and 800D polyester, that OPPOSETHIS claims is waterproof—and from our testing, we found this to be true. Rain will glide off this pack when it hits, and we’re confident that none is getting inside. The secondary external material is a combination of Polyurethane and PVC towards the bottom. This material is also waterproof, and it seems that it’s been placed here solely for aesthetic purposes—which we dig! One thing we must note about these materials—which are also used within the pack—is that they just don’t feel very nice. 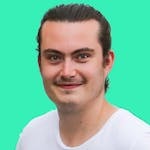 It’s not that they feel bad, but we’d expect a slightly more pleasant textile experience from a pack that places itself in the middle to higher end of the market. Every zip on this pack is YKK—a company highly regarded for making some of the best zippers on the market. The exterior zips are all reverse coil, which means the coil sits on the inside, and the fabric sits on the outside. This gives the bag a clean and polished look, which we really like. From our testing, we’ve found these zips do improve weather resistance, but it’s important to remember they’re not waterproof—so water can (and likely will, to some extent) get in if you’re caught in a downpour. OPPOSETHIS has stuck with YKK for their buckles and sternum strap, which are all plastic. Rounding off the materials on the Invisible Carry-On, there is a custom metal hook on the compression strap that feels nice and strong. The OPPOSETHIS Invisible Carry-On features two quick-grab handles—one on the top of the pack, and one on the left-hand side. These handles are great if you want to pick this pack up in a hurry, and the craftsmanship is beautiful. Though, much like the rest of the pack, the material doesn’t feel very nice. The combined Polyurethane and PVC creates an unpleasant carry, made worse by the lack of any padding. Unfortunately, things don’t get much better when it comes to the shoulder straps. 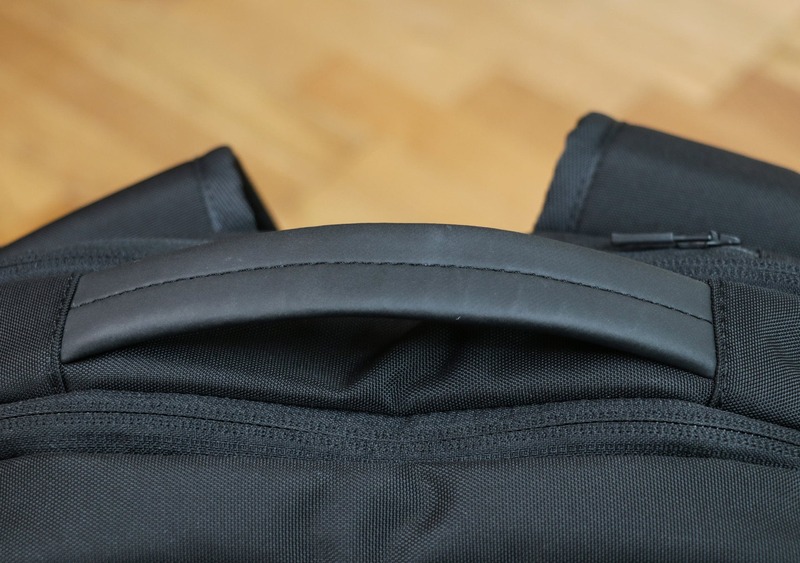 Most bag companies will incorporate thick padding or dense, thin padding into their shoulder straps—yet the Invisible Carry-On has neither. While the shoulder straps are ever so slightly padded, it’s just not enough to provide a comfortable carry for any length of time. (We think this is especially inexcusable for a pack nearing the higher end of the market.) It’s also worth noting that, on a wider frame, the shoulder straps feel a bit tight and slightly inhibit your range of motion. If you’re under 6 feet this likely won’t be an issue. The dreaded back-sweat is inevitable, but OPPOSETHIS has created a back panel that fends it off for as long as possible. Two thick strips of foam padding sit on either side, with a space in the middle for some much-needed ventilation. It’s simple, but we’re happy to report it works well in testing. At the bottom of the shoulder straps, there is an interesting system that neatly keeps all the straps together, creating a delightful #danglefreeexperience. They’ve achieved this by attaching a plastic buckle keeper that glides up and down as you adjust the length, without you ever having to play around with it—as you would if it was an elastic keeper. We like the innovation here! The Invisible Carry-On features an adjustable and removable sternum strap—which is nice and does the job well—but no hip belt or load-lifters. On a pack this size, a hip belt and load-lifters are by no means essential, and in testing, we never really missed them. You won’t see a hideaway harness system on this pack either, which considering it’s made as a carry-on for air travel makes a lot of sense. Some people do love this feature, so we’ll leave this up to you and your use case. This does seem to make sense, but we’ve also reviewed the Tortuga Setout Divide that has successfully accomplished both, so it can be done. We feel like they probably could have come up with a solution here… Maybe we’ll see that on the next iteration of this pack. OPPOSETHIS has also taken an interesting approach to their compression system. At the bottom of the pack, you’ll find two metal hooks attached to a piece of overhanging material that can be cinched down. 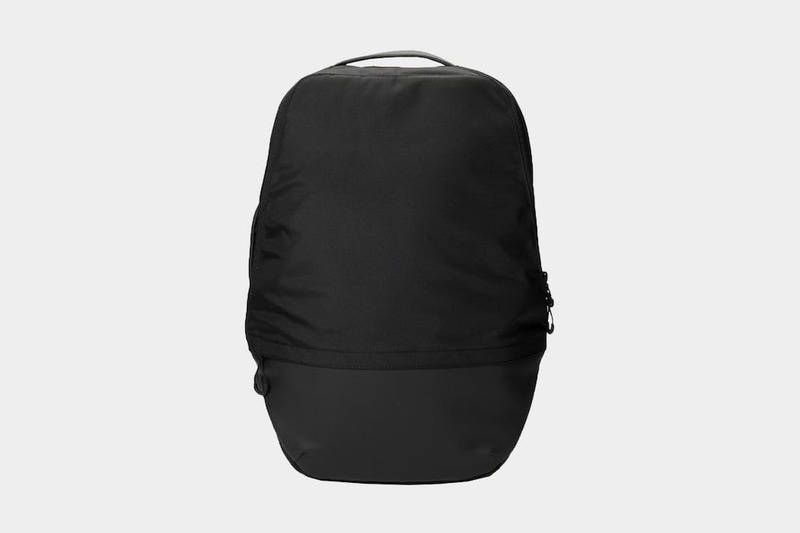 When this pack is full to the brim, this works quite well, but we have found it to be problematic in daypack mode. 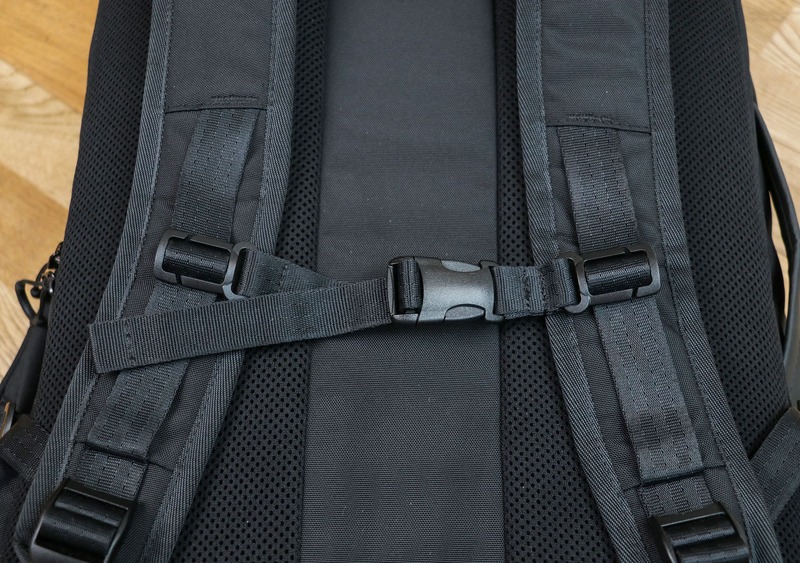 Whether you like the way this looks is up to you, but something that isn’t debatable is the fact that, in testing, the straps would often loosen and the hooks came off on their own more often than not. This is… a pretty big problem. We’ll leave it at that. 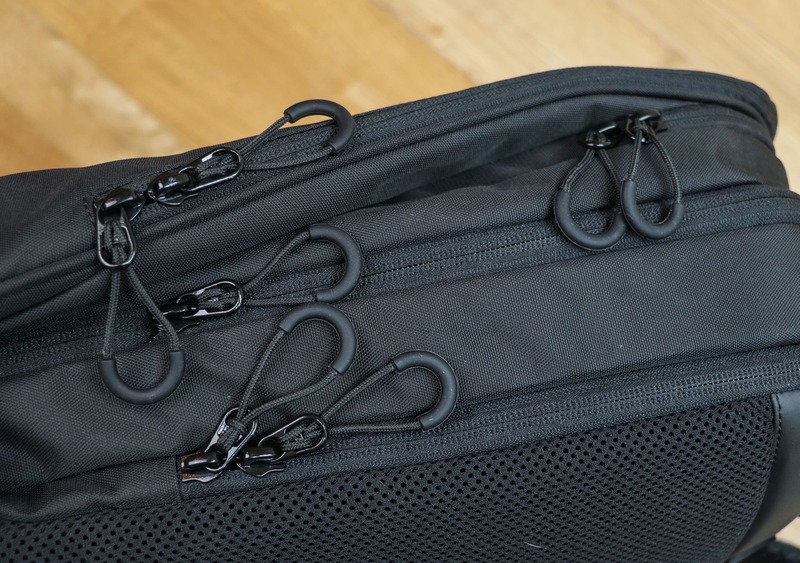 OPPOSETHIS Invisible Carry-On – So Many Zipper Pulls! Other than the top-drop pocket—that’s a YKK #5—every zip on the outside of this pack is a YKK #8. 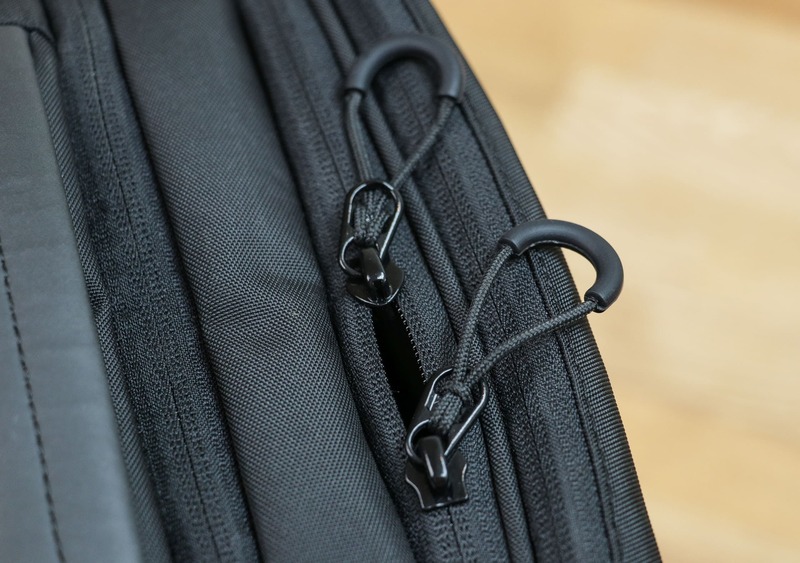 We’re big fans of the zipper pulls, but with seven of them that all sit close to one another around the side of the pack, it can be a nightmare to figure out just what zip your pulling. Even after a month of use, we still frequently open the wrong the compartment—which isn’t a huge problem, just incredibly annoying. With extended use, you may master the zips, but we would still like to see some differentiation between them, either by color or zipper pull design. 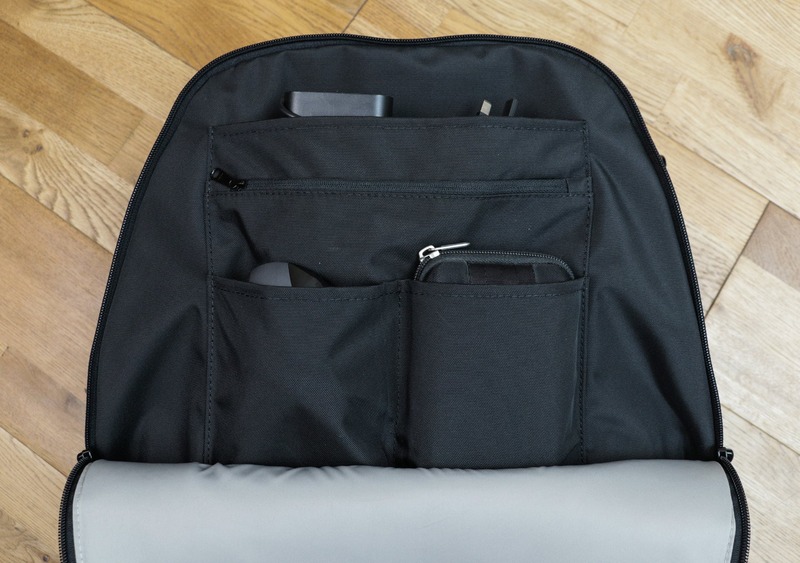 The Invisible Carry-On features two external pockets—one at the bottom, and one on the top. The top-drop pocket provides ideal quick-grab access for your essentials—like your phone and wallet. 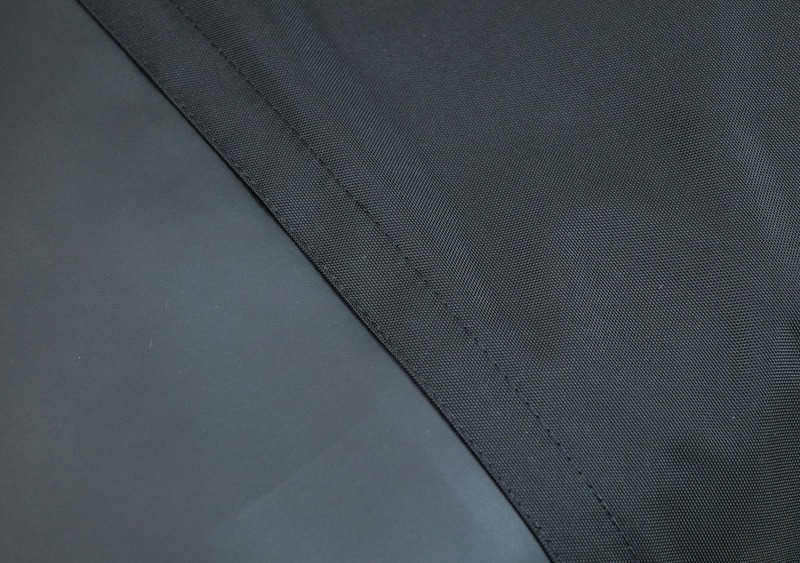 Furthermore, this top pocket has a secret zip at the bottom, which leads to… another pocket! We’re huge fans of this secret compartment and appreciate the innovative thinking over at OPPOSETHIS. This pocket is great for any items you want to keep extra secure, like your passport. The next external pocket—the one at the bottom—is a pretty straight-forward compartment for stashing a few items. There’s not a lot of dimension to this pocket—especially if this pack is full—so make sure to keep the items slim. We used this pocket for our earphones and keys, but you may find other uses. Next, there is a large compartment at the front. Here you’ll find a simple organization system that features a deep pocket at the top, a zippered pocket just below, and two smaller pockets just beneath that. It’s an easy and versatile system that allows you to utilize it however you’d like—or not at all since it lays flat when not in use. Other than the organizational pockets, there is plenty of room at the bottom of this compartment, ideal for stashing a thin jacket or sweater. Moving inside you’ll find the main compartment, which opens up all the way due to its clamshell design. 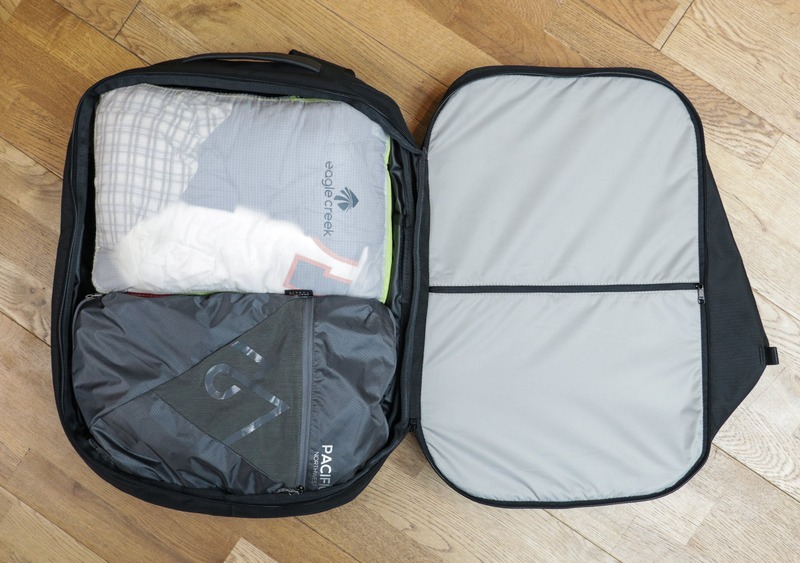 This is essentially just a large compartment that you can fill up however you’d like, and is therefore perfect for packing cubes. 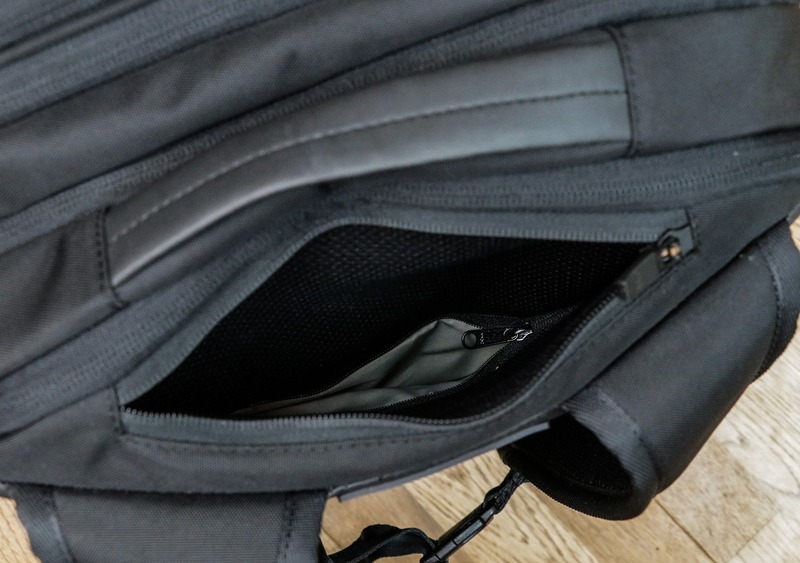 This compartment also has the ability to expand—due to that zipper around the side of the pack—which helps transform this bag from daypack size (24L) to carry-on size (33L). On the right-hand side, you’ll find the sole interior pocket, which is really just a no-frills zippered compartment. We’ve just been using this to stash items that would otherwise get lost inside the main compartment. Finally, the laptop compartment is positioned at the back of the pack. This compartment has a horseshoe style opening and stretches all the way down to the bottom of the bag. 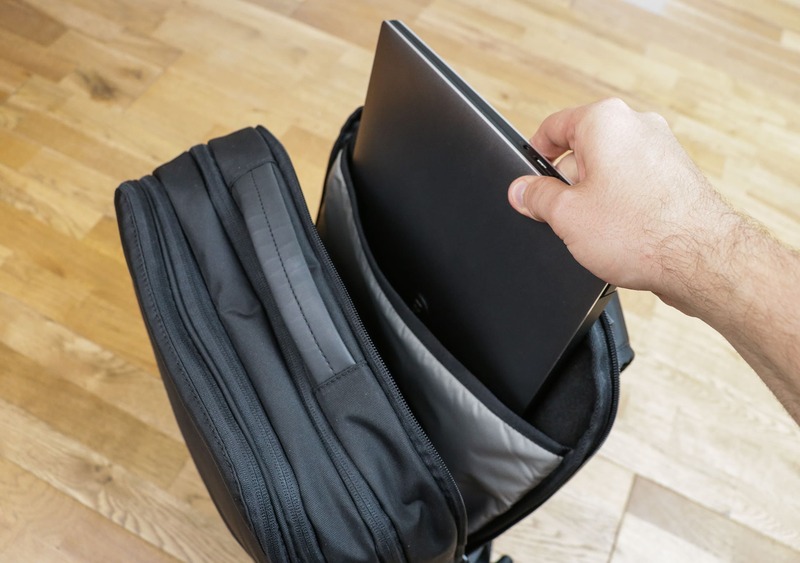 There is a felt-lined sleeve that will fit 15” laptops with ease, featuring a false bottom. We love to see these false bottoms because it means if you drop the pack, your laptop won’t hit the floor. Outside of the felt-lined sleeve, there is plenty of room to fit additional items—perfect for documents and notepads. 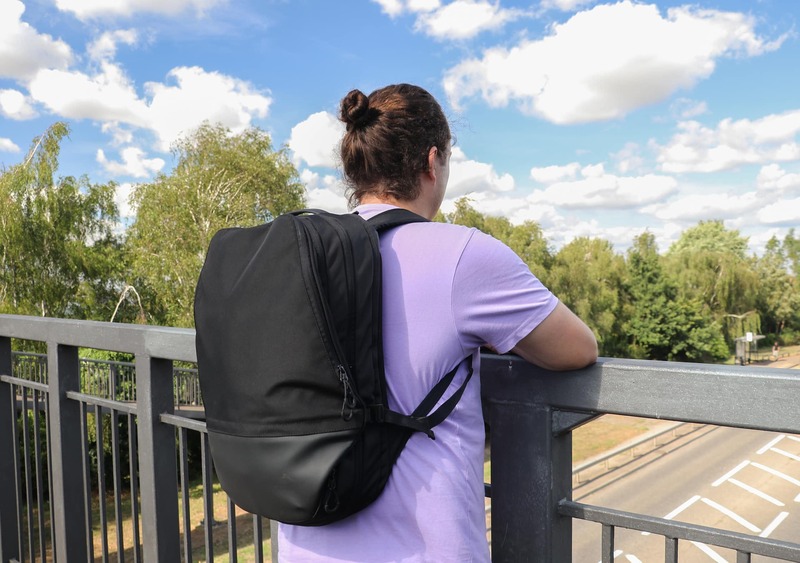 We’ve been testing the OPPOSETHIS Invisible Carry-On for a little over a month, and during that time it’s seen use in the south-west and south-east of the UK, as both a daypack and travel bag. 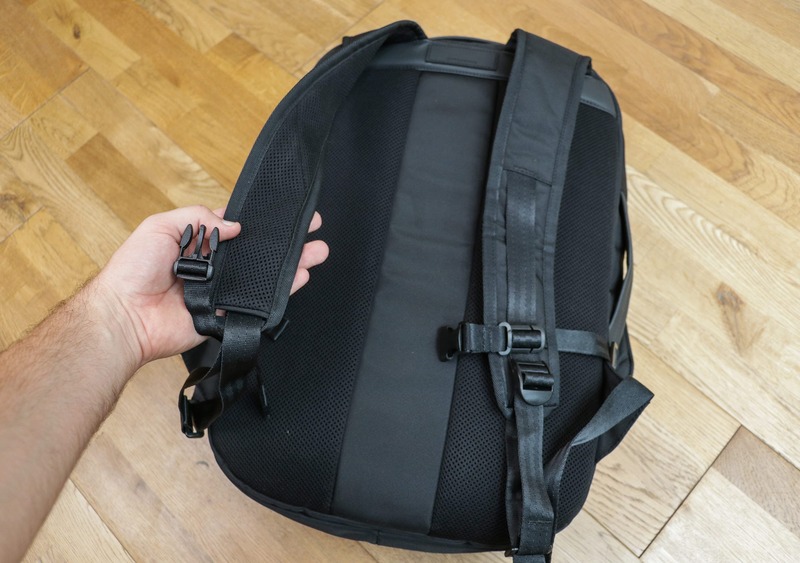 In regards to durability, there are no signs of any wear whatsoever thus far, and the pack certainly feels like it’s going to hold up for quite some time. The materials and components don’t feel the best, but they are high quality, and the craftsmanship and attention to detail are impressive. In real-world testing, we’ve found this pack to be a bit hit-and-miss. We dig the top-drop pocket, the front pocket organization, and the reverse coil YKK zips, but our gripes do stack up pretty heavily. First of all, the zipper system with several all-black zips sat next to each other is straight up confusing. Granted, this may not sound like the biggest issue, but when you accidentally open up the compression zip instead of the main clamshell zip three days in a row, it starts to get tiresome. Next, the fact that the compression straps come undone frequently is a pretty big problem, and just shouldn’t be happening. 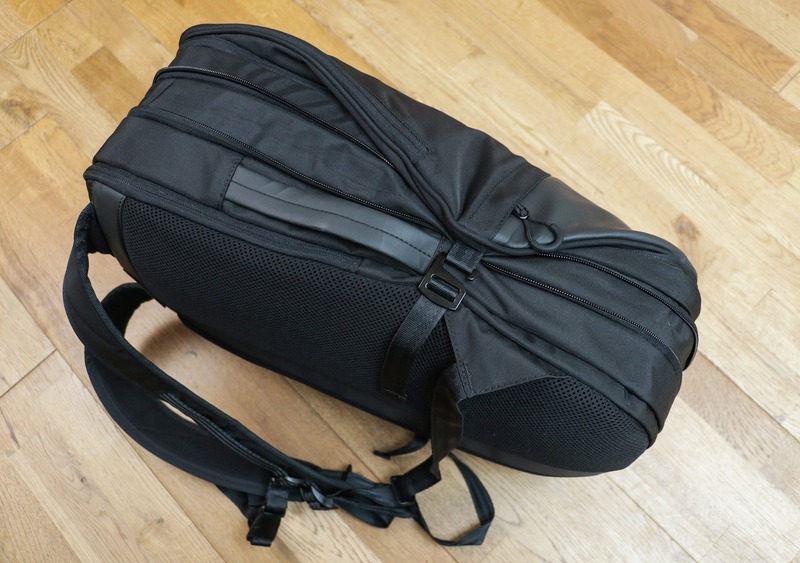 Combine this with the lack of a side water bottle pocket, not being a comfortable carry on wider frames, and bottom external pocket being near unusable when the rest of the pack is full… you can see how it all adds up. Finding the front compartment organization pockets really useful, not sure about the the overall aesthetic though. Still looking as good as new, confident this is going to hold up. Top-drop pocket with a secret compartment. Quality YKK zips and hardware. Materials used don’t feel great. Hard to find the right zipper. The OPPOSETHIS Invisible Carry-On was made to simplify the way you travel, however we’ve found that it misses this mark a lot more often than we’d like. This doesn’t mean it’s necessarily a bad bag, as it’s still made of quality materials and does have some nifty features—like that top-drop pocket. If you’re a big fan of the invisible design aesthetic and can look past things like the lack of a side water bottle pocket, then it’s worth taking a look at this pack.